You may not have heard of it, but the West African country of Mauritania has what is probably one of the most vibrant and active protest movements in the world today. Protests drawing tens of thousands of people (out of a total population of just three million) take place almost weekly in the capital Nouakchott, with many smaller protests happening on a daily basis around the vast country. The protests are overwhelmingly nonviolent — even in the face of frequent violent suppression — and have been going on since February 2011. It would be comfortable to file these protests as another part of the Arab Spring: Mauritania is on the southern reaches of the Saharan Arab belt, and large-scale protests here started with the self-immolation and subsequent death of Yacoub Ould Dahoud, an action mirroring the suicide of Mohamed Bouazizi, which set off the revolt in Tunisia. As in other Arab countries that experienced large-scale protests, Mauritania is governed by an autocratic regime whose leader, Mohamed Ould Abdel Aziz, originally came to power through a coup d’état. Firstly, the range of participating actors in Mauritania are as diverse as their agendas. While a common concern of all protest movements is the end of the rule of Abdel Aziz, there are a host of other issues that various groups want to have addressed, not all directly related to the country’s ruler. Chief among them is the issue of slavery. 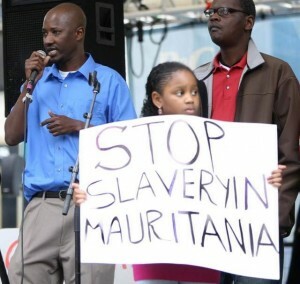 Some estimates say that up to a third of Mauritania’s population is enslaved (even though the practice has been formally abolished multiple times). Victims are overwhelmingly ethnic black Africans. This creates racial tensions in Mauritania’s multiethnic society, but also religious ones, as certain interpretations of Islam are used to legitimize slavery. Another very active group, traditionally eyed suspiciously in Western societies, are the Islamists. Organizations like Tawassoul demand a state and society based on principles of Islamic law. While not cooperating a lot with other protest movements, they have been incredibly persistent in their activities against the regime, including protests of Salafist women against democracy (which is seen as not compatible with Islam) and for the release of imprisoned husbands. With all these different actors and goals competing for internal support and attention, it is remarkable that protests have almost completely stayed peaceful for well over a year. While protesters frequently face violence from police (including kettling, arbitrary arrests, beatings, water cannons, tear gas and attack dogs), the protesters have employed a wide range of nonviolent tactics. 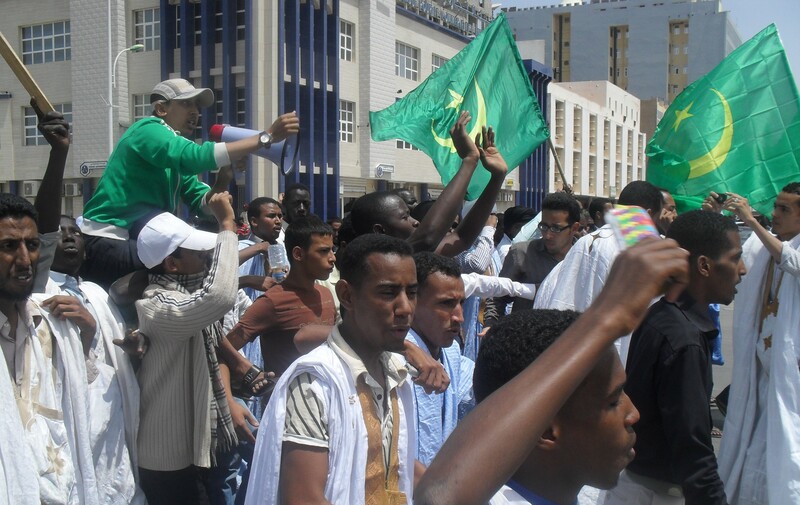 While the diversity of the protesters and their goals shows on the one hand that a vibrant civil society and widespread discontent exists in Mauritania, their disunity may still allow Aziz to carry the day. Already, the affair around the Islamic book burning by anti-slavery activist Abeid has allowed Aziz to portray himself as a defender of Islam. Given the incompatibility of demands by pro-democracy activists and Islamists, it is easy to imagine Aziz discovering his inner zealot to rally support from this part of society (a strategy tried and tested on the other side of continent in Sudan). Another possible development could see Aziz taking advantage of the regional situation. With large parts of neighboring Mali controlled by Islamist groups and the fear of an “African Afghanistan” running high in European, U.S. and African capitals, Aziz could implement some feigned democratic reforms and present himself as a beacon of stability in the region, hoping for (and probably getting) Western military support and closed eyes, ears and mouths in the U.N. Security Council and the African Union. But given the level of mobilization in Mauritania so far, the pro-democracy movements in Mauritania have a good chance of succeeding against such moves. Looking at successful nonviolent struggles elsewhere, activists in Mauritania could enhance the likelihood of success by working to undermine the foundations of the regime. Actions like strikes and boycotts can be incredibly effective, if well employed. Additionally, the protest movements could reach out to security forces, trying to convince at least elements of them to turn over to their side. After all, police and soldiers need to feel that they will be part of a better future as well, otherwise many of them will go with the devil they know instead of with the change they mistrust.